Baking with booze, yes please! You can't get a more cheeky bake than one that's been given a generous dousing of alcohol, but it's more than just tempting yourself with a booze soaked cake, did you know that a bit of tipple can actually help your bake to create a truly scrumptious flavour? It's not just an excuse to ply our latest bakes with more than a generous helping of booze, honest! A bit of the strong stuff can help achieve baking perfection when it's done properly, and besides if your going to truly over indulge with your latest bake, you may as well add a spot of tipple to the recipe! You can't picture the perfect Christmas cake without imaging it being doused in a lavish helping of sherry, so why not use some tipple to perfect your bakes all year round. I've long been fond of pouring a shot or two of my favour tipples in my bakes, and it's not just for the alcohol soaked content, a good dousing of booze in the right recipe can help to enhance the flavour and add much needed moisture to your bake. Take your classic vanilla cupcake recipe, it's already scrumptious as is, but you can easily adapt the base recipe to create any concoction of flavours in the kitchen, and why not enhance those flavours by adding a shot or two of vodka or gin to the recipe. 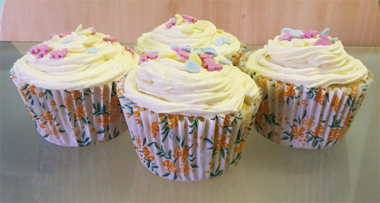 The majority of alcohol will burn away whilst it's baking, so you won't be left with a soggy gin soaked cupcake, but it will help to increase the tasty flavour of the bake, even more so when you add a dash of it to your buttercream. But it's not just about dousing the recipe in the nearest bottle of booze, the right tipple can help to enhance the flavours that it's paired with. 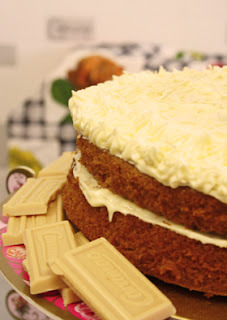 For instance a good vanilla or white chocolate buttercream can taste even better with a shot of gin added to the mix, it really enhances the sweetness of the recipe! Then there's the tipples that you choose to add for their unique flavour, you really can't go wrong by adding a few shots of Baileys to any chocolate cake, but have you tried adding a few shots of whisky to a chocolate cake? You'll be pleasantly surprised by the rich taste. 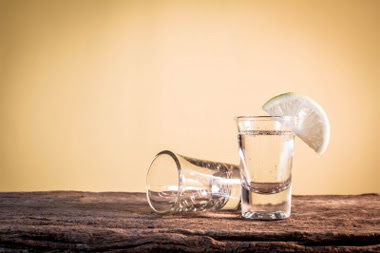 As a general rule of thumb, if you wouldn't drink it don't add it to your bake, but you really can't go wrong when baking with a dash of gin, vodka or whisky in the mix, however you choose to use it. Boozy tipple is generally best added in to the bake prior to baking if your using it to enhance the flavour, but if you want to add some more moisture to that cake, soak it in booze once it's baked. 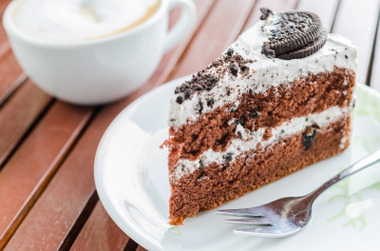 The best way to do this is to poke holes in the cake as soon as you remove it from the oven using a cake skewer, then drizzle your chosen tipple over the cake a spoonful at a time, you don't want to add more than 1-2 shots dependant on your bake of choice. For instance I found that when plying a fruit filled bake with tipple prior to baking, just 1-2 shots was enough before it started to become a little too soggy. The right mix of cake to tipple will certainly help to enhance your bake, resulting in an utterly scrumptious, and cheeky cake. Why not try adding a couple of shots of your favourite tipple to your next bake, you may even find a favourite new concoction as a result! 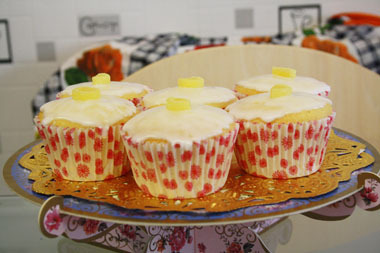 Lemon and violet drizzle cupcakes. Take in a delightfully sweet treat with these lovely lemon and violet drizzle cakes, a lovely twist on the classic lemon drizzle cake, with bite sized cupcakes that have all the flavour of the traditional bake with a tasty twist! 4 tbsp lemon juice plus zest. Pre heat your oven to 180c/160c fan/gas mark 4 and line a cupcake tray with cases. Cream together the butter and sugar till pale and fluffy, then add in the eggs one at a time and mix. Add 2 tbsp's of the lemon juice plus the zest and mix well. Sift in the flour and mix, scraping the sides of the bowl to ensure it's fully mixed in. Spoon the mixture into the cupcake cases and bake for 20 – 25 minutes till risen. Remove the cupcakes from the oven, using a cake skewer poke 5 small holes in the top of each cupcake, this will allow the cupcakes to soak in the extra lemon juice. 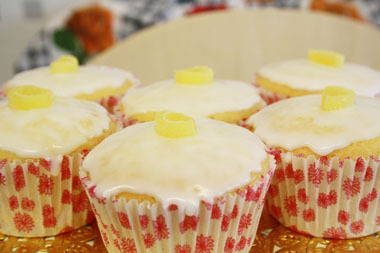 Using a small teaspoon, gently drizzle small amounts of the remaining lemon juice on top of each cupcake. Set aside to cool. Once the cupcakes are cool, mix your icing to drizzle on top. 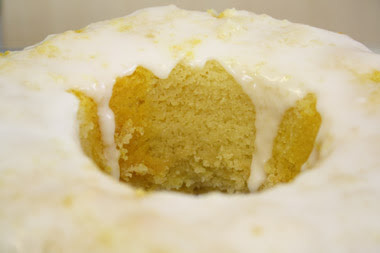 Much like with a lemon drizzle cake, you'll be spooning icing on top to finish each cupcake off. 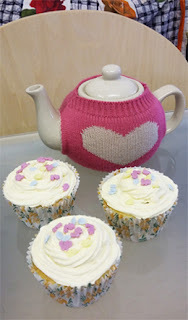 Sift the icing sugar into a large bowl and add 3 tsp of water to start mixing the icing, continue adding the water a little at a time till you've reached your desired consistency, you want it to be a little runny, but not too much, just enough to spread the icing on top of each cupcake. Then add in the violet flavouring and blend to finish. Spoon the icing on top of each cupcake, I used the back of the teaspoon to spread the icing on top to cover each cupcake. 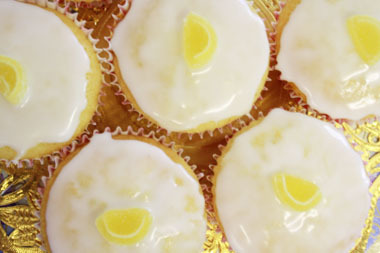 Then top off with a lemon jelly sweetie to finish! A delightfully sweet treat, and a lovely twist on the classic bake, perfect for an afternoon tea, or just because you fancy baking something sweet! Healthy, low fat cake? I thought all cake was good for you! You can throw all of the health food trends at the dinner plate that you like, but don't go bringing them into your dessert. Don't get me wrong, there's nothing wrong with having a healthy diet, but taking those tasty treats and substituting them with 'healthier', low fat' versions when you don't really need to just seems like a step too far for me.. Yes, for some a healthier option may be the choice for their diet, those of us who suffer from food intolerances and allergies often have to go for an alternative option when dining out, but following the trend and going for a raw, low fat, sugar free, fat free, fun free cake option instead just seems like your torturing yourself for no good reason. There's a time and a place for healthy eating, and you shouldn't deny yourself a deliciously full fat, sugary bake when your following a strict diet all the time, it's all about moderation, rather than completely cutting those treats out of your diet. Your body needs fat as part of a healthy balanced diet, and why not introduce that fat with some deliciously sweet cakey treats, it's the least that you can do for yourself! Besides, you can have plenty of tasty fruit and the occasional bit of veg in your bakes, carrot cake is a delicious way to take in a portion of your daily fruit and veg, especially when the carrot and raisins are surrounded by a rich, sugary blanket of delicious cake..
Just don't go convincing yourself that that beetroot heavy chocolate cake is as tasty a full fat chocolate cake, besides, why substitute on truly indulgent treats when you could just allow yourself the occasional chocolate cake binge, or two. There's nothing wrong with a deliciously fruity bake or two, but don't go healthy for the sake of following the latest food trend or diet craze. Cake is all about the deliciously indulgent, rich and sweet content baked within the layers of tasty sponge, and when your swapping that for a healthier version without any of the deliciously sweet flavours, it really takes the joy out of the bake. There's a time and a place for health food trends, and baking is one of those places that are best left out of the latest healthy eating trend, there'll be no chia seed cake for me, just a deliciously indulgent slice of victoria sponge cake, besides where's the joy in eating a healthy cake when you could be over indulging in a truly delicious slice of cake! Tea room exploration: The Fourteas. Step back in time for a delightful tea room experience that's true to the style of the era, without the fuss of rationing, so you really can have your cake and eat it without checking your ration book! A delightfully unique dining experience that's inspired by the look and feel of the forties era, from ration book menus to classic wartime memorabilia and a dash of that 'New Look' style adding to the atmosphere. It's as much about the feel of the time, serving up classic home cooked food with locally sourced ingredients, as it is about the look, rounding up the dining experience perfectly. 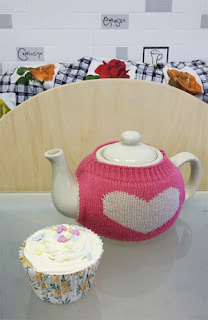 If you adore the classic look of the forties then you really will want to pay a visit to their tea rooms, for those of us that adore the fashion of the time as much as we love our sweet treats, it really is a lovely experience. Their tea rooms have got the look of the time down to a 'T', with plenty of memorabilia from the era adding a touch of unique décor, amongst the selection of the days freshly baked cakes. No detail is spared, as the charming ration book menu takes you through their selection of treats on offer, with a staggering selection of tasty tea blends to boot from The Golden Monkey Tea Company. 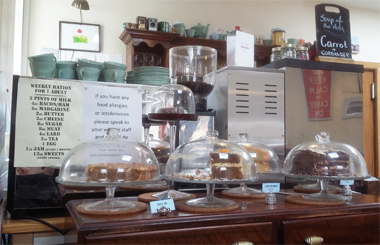 With so much to take in you'll need to remember the tasty treats, their cake counter is handily located at the back of the tea room, with a delightful selection of cake domes housing the days latest bakes. 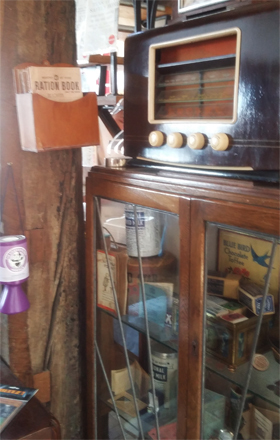 It's not all about the rationing though as their constantly changing selection of treats will show, from tasty classics such as Victoria sponge cake and coffee & walnut, to decadent chocolate cakes smothered in plenty of the good stuff! On my visit for a change from my usual cake selection I decided to try their Ivor Novello afternoon tea, featuring a delightfully decadent quartet of scrumptious treats! With plenty of treats to sample included, from a sweet mini meringue to a dainty eclair, teapot biscuit and a cupcake, alongside the traditional scone of course! A rather generous selection of treats, the cupcake was delightfully sweet and just the right size for an afternoon tea, having already munched my way through several sandwiches and the scone. For me it was a great bonus to be severed up dairy free alternatives on my stand, with their dairy free scone (which is also gluten free) and some dairy free treats included, so you can still over indulge without worrying! Their classic house blend came with the afternoon tea, a delightfully malty brew that was served in style, even coming with a handy timer to allow for the optimum brewing time. You can be cheeky and add a glass of prosecco to your afternoon tea too, but if you'd prefer to just over indulge on a slice of cake you'll find a lovely selection of cakes and brews on offer. Certainly a unique experience, and well worth the trip, having dairy free options available made the dining experience even better, with gluten and dairy free alternatives available. 5/5 | Free from options available. 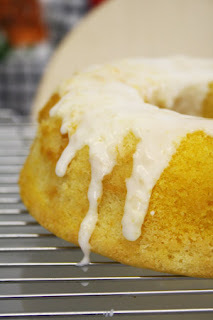 Lemon and gin drizzle cake. The classic bake gets a boozy makeover with this delicious gin soaked take on the lemon drizzle cake. A beautifully moist and scrumptious bake that looks pretty for a spring day, or any day that you fancy a boozy bake! Pre heat oven to 180c/160c fan/gas mark 4 and grease a bundt tin, this mixture will be enough for a 6" round tin also if you prefer to use one. Cream together the butter and sugar till pale and fluffy, then add in the eggs one at a time, mixing well. Sift in the flour and give it a good mix, ensuring that the flour is fully incorporated in with the cake batter. Add the lemon juice, and a splash of gin, and give it a good mix. In a smaller bowl add two generous spoonfuls of the mixture, you'll be adding the food colouring to this to create a pretty marbled effect. 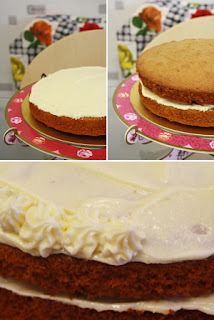 I used Sugarflair's Egg yellow paste colouring to create the vibrant yellow swirls in my cake. Add a drop of colouring to the smaller bowl of cake mix and mix well to combine. Add spoons of each mixture one at a time to the bundt tin, then run a fork through the mixture to create the marbled swirl pattern. Bake for 30-40 minutes, till a cake skewer comes out clean. Leave to cool in the tin for 10 minutes, then run a rubber spatula around the edges of the cake, turning it upside down on a wire rack to release. 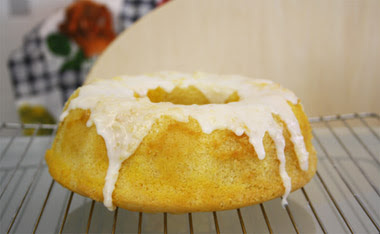 Leave to cool for a while, then mix a water icing to drizzle over the cake, I added a few drops of lemon juice and gin to mine to create a sweet icing for the top. A rather scrumptious treat: Caramac cake. If you love the flavours of this classic sweet then you'll just adore this delicious caramel flavoured Caramac cake. Inspired by the treat, this cake has a rich caramel flavoured buttercream, topped off with a generous sprinkling of Caramac on top, yum! Pre heat oven to 190c/170c fan/gas mark 5, grease and line two 20cm cake tins. Cream together the butter and sugar until pale and fluffy, then add in the eggs one at a time, mixing as you go. Using a mixture of caster and dark brown sugar will keep a lovely light consistency with this bake, as well as giving it a golden caramel colour, that's just perfect for this cake! Sift in the flour and stir well to combine, scraping the bottom and sides of the bowl to ensure it's fully combined. Divide the mixture between the two tins, then smooth the mixture down and bake for 20-25 minutes till risen. Leave in the tins to cool for 10 minutes, then remove and place on a wire rack to cool down. Whilst the bases cool start mixing your tasty buttercream. Whisk together the butter with half of the icing sugar till fully combined, then sift in the remaining icing sugar and mix well. Add the caramel flavouring, I found 1 tsp was just enough for me but do feel free to add more if you prefer a stronger tasting buttercream. Whisk to combine. 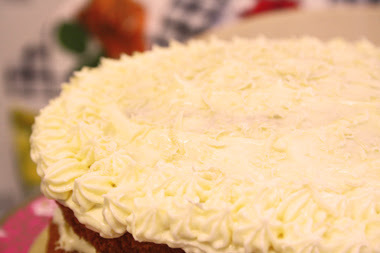 Place the base of the cake on a plate or cake board, then spoon 2 tbsp's of the buttercream on top and spread evenly over the top with a palette knife. Carefully place the top of the cake over this, then spoon 1 tbsp of the buttercream on top for a light covering, evenly spreading it over the top with the knife. Spoon the remaining buttercream into a piping bag and decorate with a lovely border around the cake, to do mine I piped simple dots of buttercream all around the edge in short bursts – pipe 1 dot then bring the bag up and pipe the next, and so on.. To finish my cake off I grated 1/3 of a bar of caramac on top using a small grater, rather than topping it with big chunks of the sweet stuff, this adds a lighter touch to finish the cake, whilst still adding some tasty caramac to the bake. Tea room exploration: Cranberry Swamp. When visiting the picturesque town of Whitby you'd expect to be hard pushed to find free from treats to over indulge on, but thankfully a lovely retro tea room has made finding those scrumptious free from cakes and bakes a breeze, and when it's in such a stylish setting as this you really will be hard pushed for an excuse not to pop in! 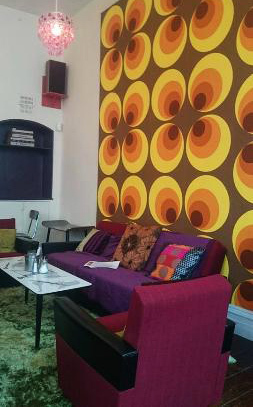 Cranberry Swamp is a delightfully retro styled cafe, with a laid back setting and eclectic decor inside, making for an incredibly relaxed and stylish environment to indulge in a spot of cake and tea. 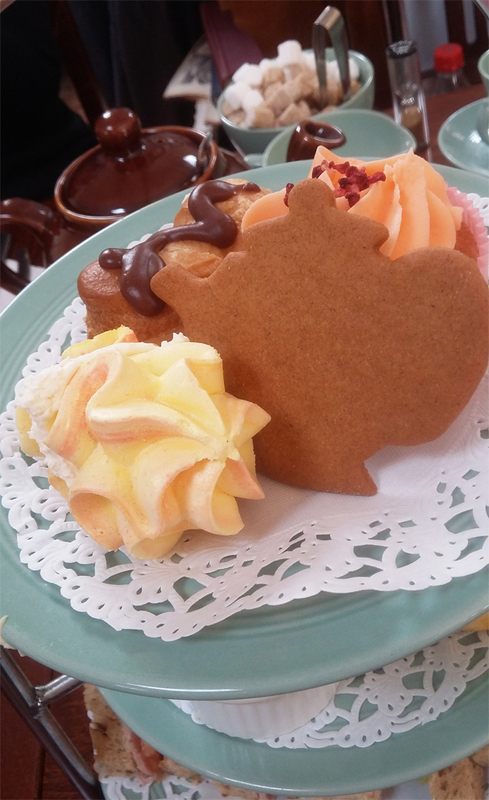 Whitby is certainly home to it's fair share of independent cafes and coffee shops, but what makes Cranberry Swamp stand out from the rest is it's free from friendly menu of treats. With gluten free options available, and a great selection of dairy free treats to boot, it's certainly a much welcome find. With it's eclectic mix of retro furnishings inside and a cake counter full of freshly baked cakes, you'll easily be tempted inside. Their cake counter is certainly a much welcome find for any coeliacs, with a great selection of gluten free bakes available every day, including some vegan and dairy free treats too. On my visit there was a tempting selection to choose from, with gluten free cakes all round, from lemon drizzle cake, to pistachio cheesecake and a heavenly chocolate cake. I decided to go for their vegan treat of the day, a mocha chocolate bar, packed with tasty layers of coconut, and chocolatey coffee. A deliciously moreish treat, the coconut layer was just divine, I could have happily sat eating a plate full of that alone! To accompany my cake I chose their chai latte made with almond milk, for me it's a sheer joy to find a dairy alternative on the menu that isn't soy milk (the stuff disagrees with me just as much as milk! ), so this made for a delightful treat! 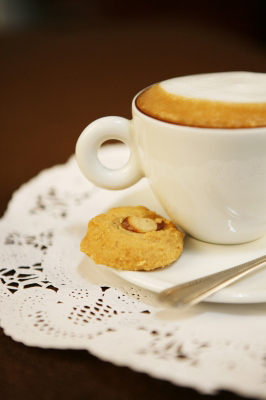 You'll find a full menu of teas, coffees and soft drinks to choose from to accompany your baked treats. All round a fantastic find, it certainly made for a pleasant change during my stay in Whitby. It's great to know that there's a free from option available with such scrumptious treats, definitely one to visit whether your on a gluten/dairy free diet or not! Free From Cake Wars : The ultimate taste test of coffee shop bakes. 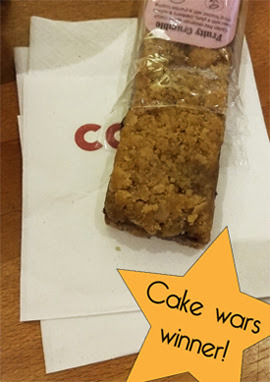 Previously my light hearted, cake munching trip to chain coffee shops around the high street has involved sampling a number of wheat packed, dairy filled, baked treats, but what do you over indulge on when your faced with just a branch of Costa or Starbucks to fill your cake cravings? I've taken to a number of coffee shop chains over the past few months to put their free from options to the taste test. First stop was Costa, having been faced with a small option of free from treats in the past I already knew they had a few options in store to try. Their free from options are sadly few and far between, but it's good to know that there are alternative options available to try in their cafes. They already offer a dairy free drink option of soya milk, but having something to munch on along with that coffee is a great addition. Blink and you'll miss them, in a separate section, usually in front of the tills, you'll find their wrapped selection of baked free from treats. Their Mini cherry bakewell tarts are gluten and dairy free, but not vegan unfortunately, a full break down of the allergens can be found on their site, almost bite sized but great for a small snack and delightfully sweet. These have been opted out in some stores though for Mini dairy and gluten free pecan pies, so if you can't find one you'll definitely find the other for a free from snack option, these are also sadly not vegan. Their Fruity crumble bar however is entirely vegan and gluten free, so a great alternative with a tasty cinnamon flavoured base and plenty of yummy fruit filling. 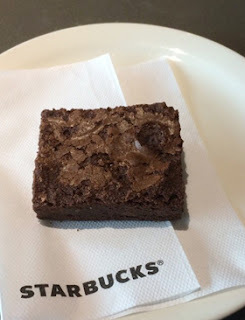 Next up is Starbucks, purely worth mentioning for their free from drink options alone, having added coconut milk as another dairy free alternative, alongside soya milk, for their drinks to their menu in recent months, as someone who can't stand soya milk (yet reluctantly drinks it in coffee shops) it's a great addition! That's sadly where the praise ends though, their free from sweet options are almost non existent, making them a better option to visit when you just fancy a drink. You will find a Gluten free brownie available, but this is often left near to the wheat filled treats so you may want to check the snack set up before purchasing, it's also worth asking for a wrapped brownie if they have any in store. It's a yummy option, even if it is the only one, with plenty of chocolate chunks in the bake, making it worth the lactose after effects for me! 4/10 for drinks options alone. Next stop is Caffe Nero, another place that offers soya milk as a dairy free drink option, so good to note for a quick coffee, for fellow lactose suffers/vegans please note that their Chai latte is unfortunately not milk free like Costa and Starbucks versions of the drink, but everything else is safe. On to the important stuff, the treats, much like the other chain cafes their free from options can be hard to spot at first, they do offer gluten free bakes, but it's best to check their nutritional info online beforehand as some of the cakes are wheat free but not gluten free, like their Carrot and raisin cake, you'll find this next to the rest of the cakes under the glass top counter, it's a deliciously sweet bake though and a great take on the carrot cake, the wrapped version if you can find it near the till is also dairy free but not vegan. Next up as a relatively new addition to the free from cake selection is Patisserie Valerie, whilst it may say on their FAQ that they don't currently offer soya milk, some of their branches have now started getting this in stock so it's worth asking for it. Alternatively they also do some great fruit tea blends and tea's without milk which I regularly do when dining here with their Earl grey and Darjeeling blends. With just a sole Gluten free brownie on their menu previously, they've recently added a whole new range of gluten free treats including a Chocolate cake on their cakes to order selection. Whilst all of the options may not be entirely dairy free or vegan it's still a step up from their previous selection of cakes. You can find the full list of gluten free options online here with allergy information available on each item. There's several gluten free treats to choose from including a rather deliciously sweet Chocolate chip muffin, their popular Gluten free brownie, and a Chocolate and vanilla marble cake which is so delicious, you wouldn't know it was gluten free at all! All of which are kept in sealed packets away from the other cakes, which is fantastic. Certainly worth at least 5/10 for adding these additional options. 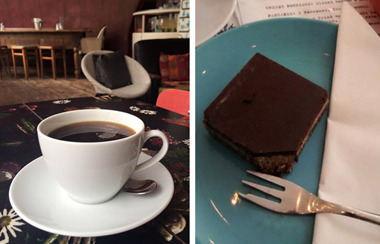 It can be pretty difficult to negotiate eating out when faced with allergies or a vegan diet on the high street, but it's good to note that these places are making an effort to improve their choices, even if it is just a solitary cuppa with soya milk at the moment. With this minefield of choices to negotiate it's hard to pin point a favourite, but with their range of choices catering to everyone, and some pretty tasty treats to boot, Costa's the clear winner here with gluten free, dairy free and vegan options to snack on. 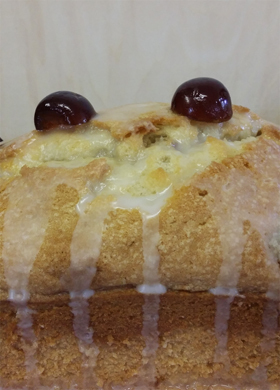 A deliciously dairy free treat : coconut and cherry cake. 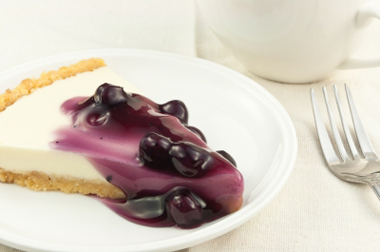 Just because you can't have a bit of dairy in your diet that doesn't mean that you have to skimp on the tasty treats! 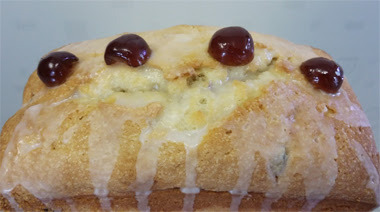 This coconut and cherry loaf cake is deliciously light thanks to the addition of coconut milk, and has a sweet taste from the cherries and a sugary icing glaze, making for a lovely treat. Pre heat your oven to 170c/150c fan/gas mark 2, grease and line a loaf tin. I usually turn my tin upside down and cut out a strip the same thickness as the base to line the tin, it's worked everytime and makes removing the cake that much easier! Cream together the sugar and margarine, as your using less margarine than usual the mixture won't reach the same consistency as usual when creaming them together, but it will result in a light, fluffy mix. Add in the eggs one at a time and mix, this will result in a lovely loose runny mixture. Sift in the flour and baking powder and bring the mixture together, it will be a bit stiff at this stage so don't worry. Next pour in the coconut milk and mix, the mixture will loosen to a lovely light consistency. Then finally add the chopped cherries, before adding them to the mixture roll the cherries in a small amount of flour to cover them, this will ensure that they don't all sink to the bottom of the cake! Fold in the cherries then spoon the mixture into the tin and bake for 50-60 minutes till a skewer comes out clean. Leave the cake to cool in the tin for an hour, then remove and place on a wire rack to cool. Finish off by making water icing and drizzling the glaze over the top of the cake, adding a few chopped cherries on top to decorate. Recipe inspired by and tweaked from Baking bar. A cake eaters joy at the perils of living with lactose intolerance. You don't need a run down of the symptoms, you've already spent countless hours feeling like an orchestra is constantly tuning up inside your stomach. Rather than bore you senseless with yet another list of reasons why you may or may not have lactose intolerance, I take a rather helpful look at what it's really like living without lactose. How many hours have you wasted looking online at ingredient listings, and restaurant recommendations only to find a pitiful mere selection of treats that you can actually enjoy in comfort?! We've all been there, finding out that your stomach no longer loves lactose can be a complete nightmare, but that mournful loss of cheese in your diet will soon pass, and you'll find yourself getting used to a new, lactose free diet. 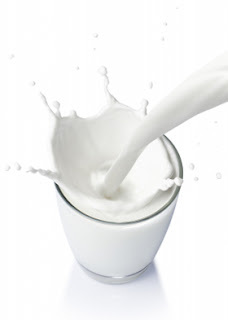 It's not a straight forward change when you find out that your lactose intolerant, you'll be surprised at how many food items contain traces of dairy as part of their ingredients, it will involve for some, a complete lifestyle change, but it's one that will leave your stomach feeling much happier afterwards! The obvious changes are easy to make, and aren't as painful as you may expect, if like me you've developed a severe aversion to drinking soya milk (that lovely chalky after-taste will stay with you for hours..), you'll be relieved to know that lactose free milk does exist, it's a little sweeter than ordinary milk, and a little pricier, but if you live with milk day to day like I do, with my tea drinking addiction, sorry habit.., then you'll be beside yourself with glee at discovering lactose free milk. Lactofree is the main lactose free milk brand that you'll find in most major supermarkets here in the UK, but you'll also be pleased to know that M & S also do their own brand lactose free milk too, personally I prefer the taste of this one for a little treat every now and then! Basic dairy items like margarine and cheese can also be found in lactose free form, with a lovely selection of spreads and cream cheeses from Lactofree (you really can't tell the difference between their cream cheese to Philadelphia! ), with M & S also offering a great lactose free spread too. If you prefer a more dairy free alternative, you can find a great range of soya, coconut, rice and almond milks in most supermarkets, Alpro offer a great mix of soya and coconut milk blends, alongside their range of spreads and dairy free desserts. Try for yourself to see which you prefer, I live by lactose free milk most days, with the occasional bit of coconut milk, which is great for coffees. It's not just supermarkets either, these days you can opt for a soya latte at most chain store coffee shops and cafes, from Costa to Starbucks and Pret, with Starbucks also offering coconut milk, try it in one of their lattes for a lovely light drink! For day to day food items, you'll be surprised at what items include milk, items like pastries are a given with their buttery content, but you'll need to check those ingredients over on items ranging from cereals to sausages. Lactofree has a great lactose detector list on their site, listing food items that are at risk of containing milk to help you plan your diet. One countless culprit I've faced when shopping is Whey, you'll unfortunately find this as bulk ingredient used in many products, from instant soups to stock cubes and even crisps (even those of the non cheese based variety! ), it may seem a pain at first, but learn to read those ingredient listings on items as you do your food shop, you may even want to look online at supermarket websites, with most listing ingredients on items as you shop online, to save time when shopping. You'll come to learn what items and brands to avoid, with some using whey and milk proteins more than others. But it's not all bad news, you'll find a great selection of free from items in most supermarkets, with frozen and cupboard staples in designated 'Free From' sections. It will vary from place to place, I find my larger local Tesco for instance has a better selection than the nearest city branch, with a better selection at a smaller Sainsburys than the largest nearer store! Most have a great range of own branded products, with items varying from chain to chain. You'll find a great selection of staple items, such as breads, pastries and yes, cakes, with a good dairy free range available. Of course, the sweet treats are mostly what we're all interested in as keen cake fanciers, so you'll be pleased to know that a fair few supermarkets and health food shops offer some great sweet treats that are dairy free. Sainsburys, Tesco and Asda have a great bakery selection of treats from cherry bakewell tarts, to chocolate brownies and cake slices in their own branded Free From range, with most also stocking treats by Genius, Mrs Crimble's and Lazy Days, from rocky road slices to cupcakes, so you can over indulge without having to bake! It's not just cake either, over indulge on some yummy chocolate and biscuits, with most supermarkets offering a dairy free chocolate range,Sainsburys chocolate orange bar is worth snapping up as a great dairy free alternative to 'ahem' Terry's chocolate orange, alongside the yummy range by Moo Free which you'll find at Sainsburys and Holland & Barrett. Sadly when it comes to eating out, most dairy free options tend to fizzle out in most chain shops and restaurants, independent cafes do exist thankfully where dairy free alternatives are more freely found, I could be here all day recommending a few, but that's where a future post may pop up! You can find a few mere options for dairy free treats, but lunch options are few and far between sadly, but thanks to the recent EU legislation, by law all restaurants should be able to provide you with allergy listings for all of their meals when asked, Costa and Cafe Nero are great at showing allergens on their site so you can plan in advance what's safe to eat. 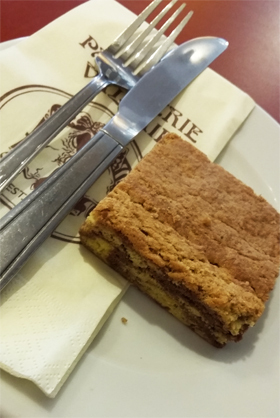 As for those food options, you'll find a sole option at most places, Cafe Nero do a lovely (thankfully wrapped) gluten and dairy free raspberry and coconut slice, with some tasty (wrapped again) gluten and dairy free cherry bakewell tarts at Costa. So far, this is all I've found that's completely safe to eat, which does often leave you a little sad when eyeing up all of those delicious baked treats, so it's best to keep a dairy free treat or two stashed in your bag on the go. I've been swearing by Eat Natural bars ever since I found out I was lactose intolerant, with most of their bars (bar the yogurt coated ones of course) being dairy free, yes, even the dark chocolate ones! It's also worth noting that Lactofree have a selection of long life milk pouches that are great to pop in your bag on the go, so you can grab a cup of tea anywhere knowing that you have some lactose free milk to hand! You'll get used to constantly looking online for allergy advice at most cafes and restaurants, you'll also be mortified at how many places have a cheese heavy menu as you scroll through those options. With some guides it's worth noting that the risk of cross contamination is often tied in with the use of milk as part of the ingredients with some menu listings, so use your best judgement here. Non-cake related places I've visited like Eds easy diner, Wagamama and La Tasca have a great allergy menu and the staff have been incredibly helpful when ordering alternatives and swapping meal options around. With everything it's a case of trying it out and seeing what you prefer, some items I've tried, tested and really disagreed with myself, but you may find yourself adoring them. Explore the Free From aisle at your local supermarket, if you can't find it flag down a member of staff and ask, most have even a small selection lurking in the corner with some options available. Eating out will be the biggest brunt of all, I still loathe finding little lunch options available, but you'll come to build up a list of foods and places where you can safely eat, the free from options may even not seem obvious at first, so take a good look around online and explore the allergy info at your favourite places. 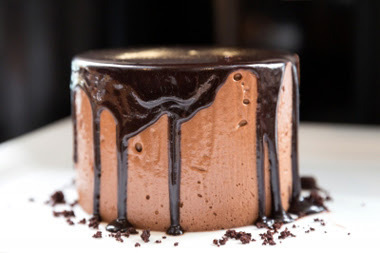 There are times when you may just want to risk it, and you'll get used to those gurgling, rumbling sounds after eating, besides, sometimes you just want to dive into a cream cake! Plan your meals out, and eat plenty of lactose free meals around those lactose treats, and your stomach will at least be a bit happier with you afterwards. Whilst you may feel a little sad at first having to cut so much dairy out of your diet, you can at least find some wonderful alternatives that will make life a little easier! As a side note, do always consult any changes to your diet with your doctor, I'm NOT a trained professional, just a keen cake eater whose recently become lactose intolerant. Images: Glass of milk Somchai-Som/FreeDigitalPhotos.net | Cheesecake slice Chawalitpix/FreeDigitalPhotos.net | Cup of coffeeAkeeris/FreeDigitalPhotos.net | Coffee and cakeMrsiraphol/FreeDigitalPhotos.net. A staple recipe, if ever you needed one. 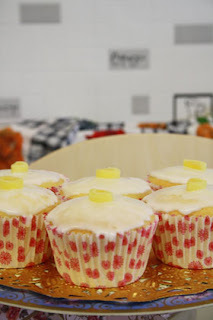 These vanilla cupcakes are utterly delightful and easy to bake, you can even adjust the recipe as a great base for any cupcake recipe, it's deliciously versatile! Cream together the butter with the sugar till pale and fluffy, you'll notice the change in colour after a minute or two of whisking. Add in the eggs one at a time and whisk as you go, ensuring that they're fully blended. Sift in the flour and fold to combine the mixture, scraping the sides of the bowl to ensure that it's fully mixed. Then add in the vanilla extract and mix to combine. The end result will be a lovely light mixture. Spoon the mixture into the cupcake cases, filling each around 2/3 full, then bake for 20-25 minutes till risen and golden. Remove the tray from the oven and place your cupcakes on a wire rack to cool, after letting them set for a minute in the tray. Once cooled, make a start on your buttercream. Mix together the butter with half of the icing sugar till combined, whisking for another minute to ensure it's fully mixed. Sift in the remaining icing sugar and mix again till fully combined, followed by the vanilla essence to finish. 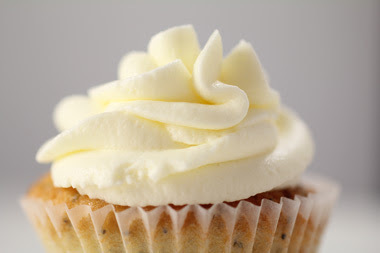 Whisk your buttercream for 2-3 minutes to reach a lovely light consistency. Spoon the buttercream into a piping bag, I used a star nozzle with mine to create the finished effect. Pipe in a clockwise direction around the top of each cupcake, ensuring that they're fully covered with buttercream, adding a second smaller layer of buttercream on top of that to create a peak in the centre of each cupcake. Decorate with sprinkles for a lovely finishing touch on top of each cupcake. Recipe adapted from: Mary Berry at Red Online. We've all had crème egg brownies, but what happens when you add some tasty marshmallows into the mix?! 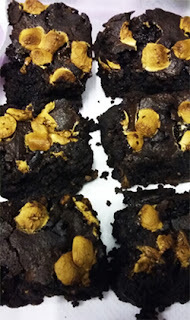 These yummy easter brownies have all the soft, squishy goodness of a chocolate brownie with a generous helping of mini crème eggs and marshmallows added in for one rather tasty bake. Melt down the butter on a low heat, you can easily leave this melting down whilst you weigh the rest of the ingredients. Melting the butter, rather than creaming it with the sugar, will help to add that deliciously squishy consistency to your brownies. Add in the eggs one at a time and mix, followed by the flour and cocoa powder. Pour in the melted butter and mix well to combine, followed by the mini marshmallows and stir. 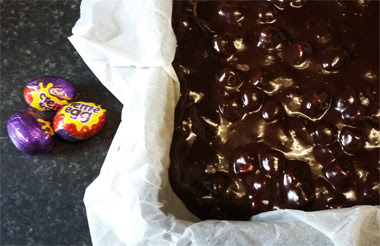 Cut your mini crème eggs into halves, then add these into the brownie mixture, and give the mixture a good stir to ensure it's fully combined. It should be thick but liquidy at this stage (see the photo here for an example). Spoon the mixture into the baking tin, smoothing it over with the back of the spoon to level it out. Then top with a small handful of mini marshmallows to finish, these will toast as it bakes like a tasty smores topping! Bake for 35-40 minutes, till a skewer comes out clean, the marshmallows will have melted down at this stage so if it's just thick marshmallow goo that comes out then they're done! Leave the brownies in the tin for an hour to cool, then cut into squares and remove from the tin by gently removing the baking paper. Place on a wire rack to cool. 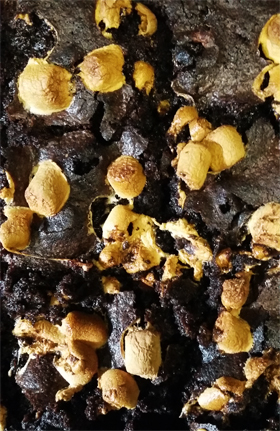 The combination of mini crème eggs and marshmallows makes for a different, but incredibly tasty twist on the usual crème egg brownie, think rocky road with a cakey twist and you've got yourself a yummy batch of easter brownies! 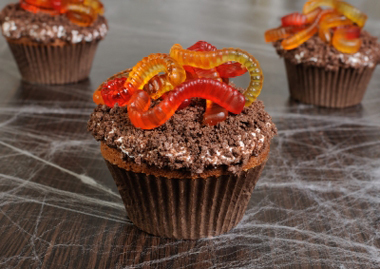 Bake up some spooktacular treats this Halloween. It's that time of year again when we feel a sudden urge to munch on a tasty brain shaped cake, without having fallen to a zombie virus. But if your feeling a little too much like the living dead you can still put together some spooktacular treats to over indulge on for Halloween, without a horrendous amount of effort thanks to some of these handy and rather cheeky baking tips! An easy effect to make any bake look extra spooky, whether you want to add blood dripping vampire teeth marks to your cupcakes, or zombie blood splatter to your cake, you don't have to go making your own batch of gooey fake blood, simply whip out a packet of strawberry sauce! To make it extra realistic add some extra red colouring to the sauce and mix to your preferred shade of blood red, then apply to your bakes. 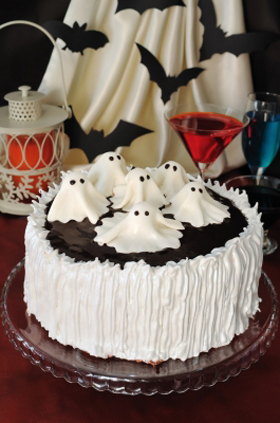 An easy way to make any bake look spooky is with a palette of Halloween colours, turn the classic marble cake into a spooktacular treat by mixing up shades of orange, purple, black, green and red, to create an instantly spooky bake. This effect looks particularly amazing on a bundt cake, swirl the colours in for a marbled Halloween bake, you could also add a ghoulish dripping topping for an extra spooky effect in clashing shades of orange and green. Put a ring on it - a ring of spiders. Top your bakes with a spectacular spiders web, a great way to dress up a batch of chocolate cupcakes or a tasty chocolate cake. Simply top your bake(s) with a tasty chocolate icing and leave it to set for a few minutes, then pipe a swirl of white icing on top, take a toothpick and drag lines through the piped swirl of icing, creating an instant spiderweb effect. There's a great 'how to' for this technique over at Buzzfeed, if you need a visual aid to create the effect. Cheat a little with some tasty decorations. Sometimes we don't all have the time to create the perfect Halloween bakes, so why not save yourself some precious time with the tipple by adding some instantly spooky decorations to your bakes! It's incredibly easy to find some tasty spooky shaped sweets these days, most high streets shops have a great selection of gummy and chocolate shaped spooky sweets, from gummy eyeballs, to vampire teeth. Simply pop your chosen sweets on top of a batch of freshly iced cupcakes and you've got yourself a sweet selection of spooky bakes! You could also add some strawberry sauce blood to your sweet toppings for an extra spooky treat. You don't have to spend hours working on the perfectly spooky treats, so you can easily save time for that all important cocktail drinking and over indulging this Halloween! 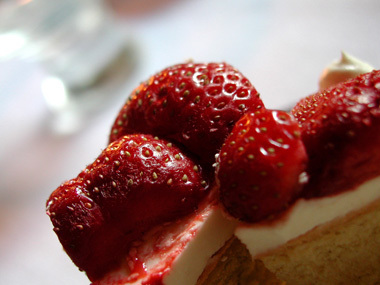 Free from bakes and cakes : Not just a diet fad. Cake shop exploration : Primrose Bakery. Cake shop exploration : Cutter & Squidge. 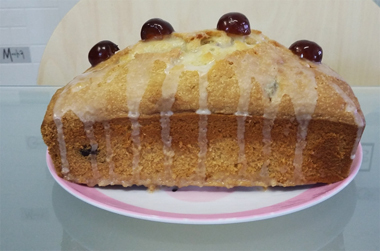 Christmas apple and sultana cake. Cake shop exploration : Crumbs & Doilies.